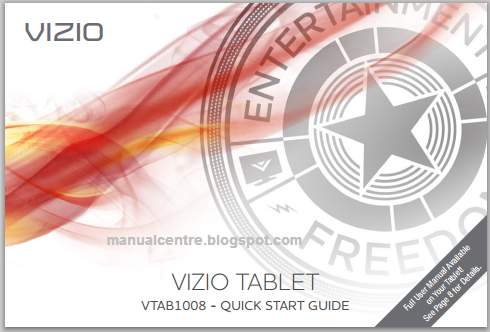 The Vizio VTAB1008 manual has been published by vizio.com. For owner of this tablet, you can download this manual for free. This manual contain important information such as about tablet layout, internet connection settings, unlock guide, using touchscreen, using apps and troubleshooting via FAQ on page 14. How do I change the background image on the Lock screen? How do I bookmark a favorite Web page in the Browser app? Open the Browser app and navigate to the Web page you want to bookmark. Tap the Bookmark icon in the upper right corner. Your current bookmarks will be displayed as thumbnails. Tap the Add thumbnail image. Your Web page is bookmarked. How do I erase my viewing history in the Browser app? Open the Browser app and tap the Bookmark icon in the upper right corner. Tap History. Press the Menu button. Tap Clear History. Your browsing history is erased. How do I set a new home page for the Browser app? Open the Browser app, then press the Menu button. Tap More > Settings > Set home page. Use the on-screen keyboard to enter the URL of the new home page, or tap Use current page to use the Web page you are currently viewing. Tap Settings > Privacy > Factory data reset. To confirm you want to reset your Tablet, tap Reset device. This will erase all data from your Tablet’s internal storage, including your Google account, system settings, app settings, and downloaded apps.